Sonic the Hedgehog sporting goods! Everything you need for a day outside? 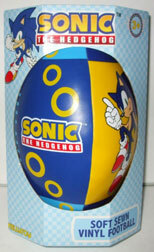 Yes, this is another improbable page of Sonic the hedgehog merchandise. This time, he helps you play out side and run around. This is actually rather appropriate, if you think about it, and what Sonic stands for. A logical progression would lead to "activity" aids such as these. Skateboarding is fun, so why not a Sonic skateboard? This one says "Real Cool Dude Sonic the Hedgehog With Attitude". This is actually the top of the board, and someone has removed the wheel assemblies. All Sonic skateboards are rare, never miss a chance to pick one up! They are also quite large, so mind the shipping. The art on this one is not the best...and you can see that it came in two versions (neither one bothered to color his ring properly, though) How do you tell them apart? Look at his legs from one to the other! The wheeled board (far right) is the bottom of the same skateboard. It used different art for the top and the bottom. This is a "Zone Zapping Sonic the hedgehog Attitude" skateboard. With the famous foreward-facing (unflattering) stock art. At least the bottom is colored properly, though. It seems to be made of dark blue plastic. If you go skating, you'll need some knee and elbow pads! This set is appropriatly checkered, and is kid's sized. The bottom strap just randomly says "With attitude! ", what's with the overkill here? 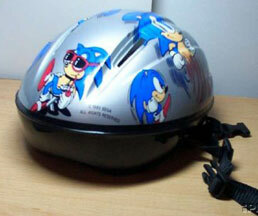 A bike helmet is a good idea for Sonic theme merchandise. Nice big item, always visible when worn, and encourages excersize. 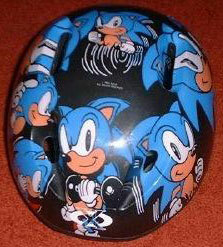 This was the first helmet produced, and features the usual stock art of Sonic plastered all over it. Even the seldom used "Weight Liftin' Sonic" appears, probably to continue the excersize theme. Another Bike helmet. 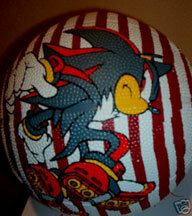 This is probably the second of the 2 known USA released Sonic the Hedgehog theme cycling helmets. Made in kids' sizes, this one features a somewhat slick-er design then the previous helmet. This MAY have been avialable in Target stores sometime in the late 1990s. 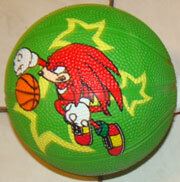 A Sonic, Shadow and Knuckles basket ball. How unusual! These do not seem to be Sonic X specific, but still have rather cool art. They took good measure to make each ball different and special. These are standard size, though it's hard to tell in these photos. Still, they make a great collectible! Too bad no one knows where to find them...and anyone who sells them over ebay won't tell you. See the texture? These are all BasketBalls. 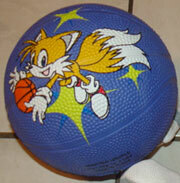 A Sonic the Hedgehog "Game Ball". It is approximatly the size of a tennis ball, and made of tough rubber. 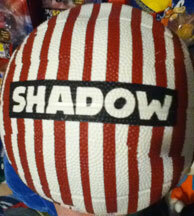 The surface is uneven, so it will bounce in a 'crazy' way when you throw it. 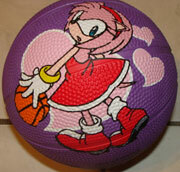 It is rather appropriate to have a Sonic ball, but the execution is just OK.
Where can you put your sporting goods? 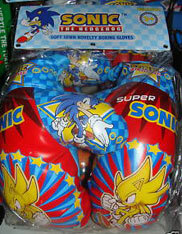 Into the Sonic the Hedgehog sports duffle bag! 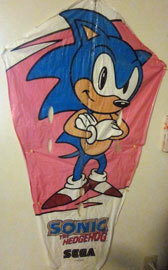 This big bag is decorated with the rare 'football catchin' Sonic', and features other stock arts placed around tennis, soccer, basketball and baseball items. The ends have star bumper pictures, and the top is the traditional checker pattern. Here's a mini basketball set for use indoors. It looks like it might be from the same manufacturer as the bat & ball set seen above, as it too has stars and primary colors as a theme. The backboard has the winged ring (reminicent of early Sonic games) but with SA1 style Sonic in it. The ball is rather creativly designed as well, in more primaries but this time with dots instead of stars. It looks like it has everything you need included, even to mount it. These were available at TJ Maxx Stores in the USA. However, TJ Maxx is a close-out store, for the most part. They were likely available elsewhere as well. The third item from this same mystery manufacturer! It is likely KellyToy that is making these sporting items. Can it be confirmed? This pair of boxing gloves is actually pretty cool. They're quite detailed with fitting Sonic imagry, including *Super Sonic*! He appears on the front of the fist, while a lesser-seen modern era Sonic is jumping in front of a star background on the thumbs. The cuffs have blue tone checkers, a star with the logo and a line of rings. SS is even named on them, with 'super' added in a different font to the old-style Sonic logo. Surrounded with a ring of stars, the design is very dynamic looking. This is quite a well put-together looking sporting good...great for collecting, and especially stylish with the nice rendition of SS...IF you can find them. Likely released fall 2009, and was available at TJ Maxx. Photo discovered by Berzerker. Here are some fun mini basketballs. They're textured like regular balls, but they're all only about 5 inches in diameter. Each mini play ball has one of the newer 2011 character stock arts and a shape for the background. Amy has hearts, Knuckles twisty stars & Tails with sparkles. The art has also had a basketball picture added so it looks like the character is interacting with it. (except Knuckles, who just seems to be jumping past it) Where is the Sonic themed ball? If you have a photo, send it in for credit! You can see the copyright info at the bottom, but what does it say? Where can you buy these? Photos discovered by Trogdorbad. Here is a selection of 3 different Sonic themed balls. They aren't really sports balls, but likely all fall into the 'hi-bounce' category. 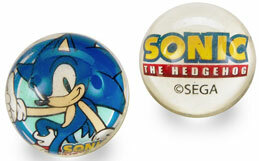 The first, at left is a SA1 era "Superball" type. It's made of primarily clear tough rubber that has a flat disk embedded in the center. 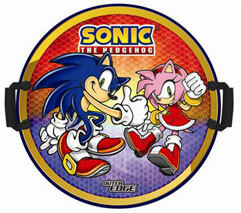 One side has Sonic & the logo, the other just the logo with Sega copyright. A clear ball like this must not be bounced. Proper care includes NOT bouncing it because scuffs to the surface reduce the clarity of the rubber which can't be fixed. (It will become opaque/can't see the design. Taking care to not bounce the ball is difficult, but necisary for collecting. 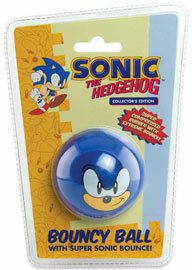 The "Sonic Face Bouncy Balls"...are these the same ball, just in different packaging? The left side ball is a "Collector's Edition" in a square box for stacking on store shelves. 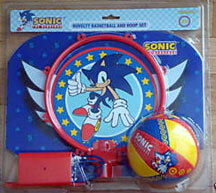 It says "With Super Sonic Bounce!" The right side is in a off-rectangle clamshell package for hanging on store pegs. It has the same slogan, but says in the red shape "Composed of Compressed Rubber For Super High Bounce!" Nothing indicates the sizes of any of them. Where are these sold? 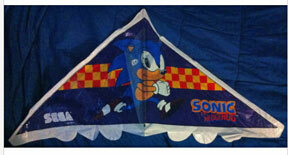 Here is the kite from the package above. It is an obtuse triangle, or "delta shape". You can see that it is close to blue/purple color as described on the package. The bottom has 6 little half-round flappy things. (what are those for?) & the Sonic is printed right in the middle where the strings attach. Remember: this is big, at about 50 or so inches. It's nice to see what it really looks like, outside the package & unfolded for use. 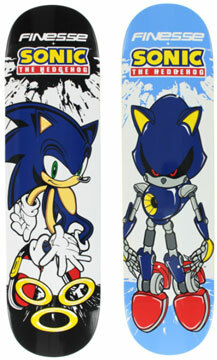 Finesse Skateboard supplies has crafted 2 cool Sonic themed decks. One has modern Sonic sliding forward to catch 3 rings, and the other has Metal Sonic hovering. Each one uses a 'paint splat' type background with white. Sonic's splat is black & Metal's is light blue. Both have the modern logo at the top, as well as the Finesse logo. The top of the board has a dark wood-grain texture, and the Sonic & Finesse logo repeated.